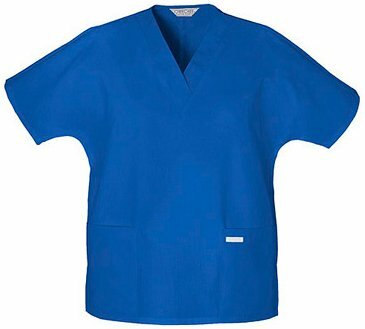 With dolman sleeves and front patch pockets this is a classic V-neck scrub top from Cherokee. 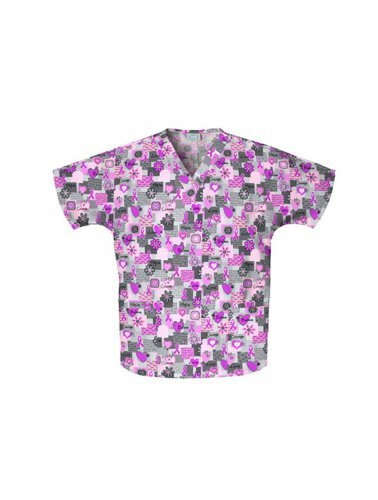 It features a Breast Cancer Awareness print. The right pocket also has an interior cell phone pocket. Tunic length it has side vents to keep the fit easy. 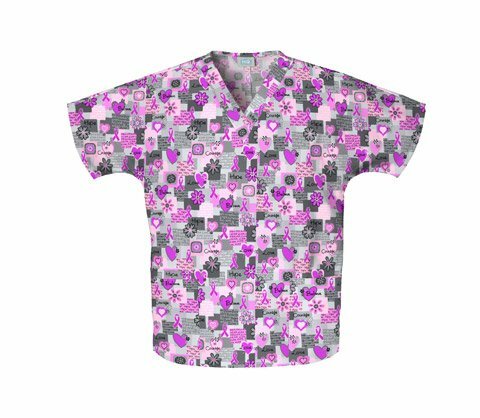 Missy traditional classic fit V-neckline Dolman sleeves Side seam vents Two patch pockets cell phone pocket Breast Cancer Awareness print 26 1/2" long 65% polyester 35% cotton This product can be shipped anywhere in the 50 United States Puerto Rico The US Virgin Islands and APO and FPO addresses. Sorry we cannot ship this product to any other address. Dolman sleeve, v-neck tunic with side seam vents and patch pockets. Center back length 28". Poly/Cotton with soil release. 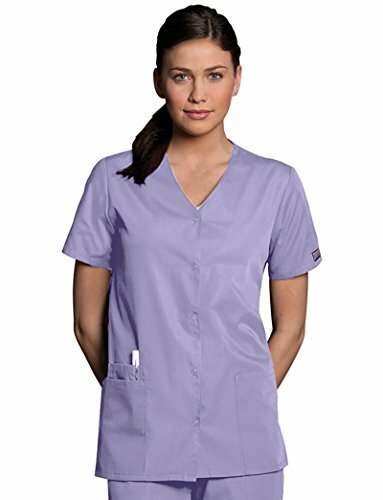 This short-sleeve snap front tunic scrub top from Cherokee Workwear Originals has two patch pockets one cell phone pocket and side vents. 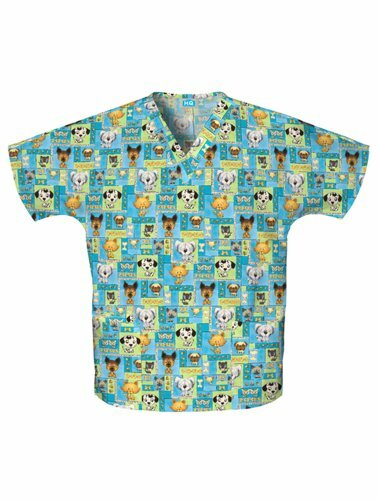 Made of soil-release poly/cotton poplin. 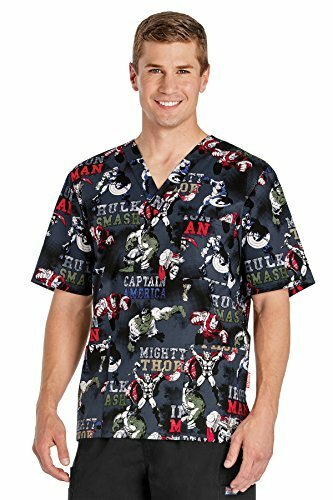 Missy traditional classic fit Tunic scrub top Five snap closures Two patch pockets one cell phone pocket Side vents 26 1/2" long (Medium) Soil-release 65/35 poly/cotton poplin This product can be shipped anywhere in the 50 United States Puerto Rico The US Virgin Islands and APO and FPO addresses. Sorry we cannot ship this product to any other address. Dolman sleeve, v-neck tunic with side seam vents, two patch pockets and a cell phone pocket. Center back length 26 1/4". 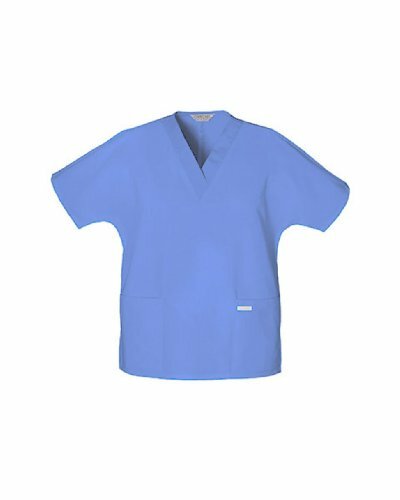 "Dolman sleeve, v-neck tunic with side seam vents and patch pockets"
Cherokee scrubs are made from a durable and soft Poly/Cotton Poplin with soil release fabric that gets softer with every washing. Sizes: XXS (31-32 inch chest), XS (33-34), SML (35-36), MED (37-39), LRG (40-43), XLG (44-47), 2XL (48-51), 3XL (52-55), 4XL (56-59), 5XL (60-63). 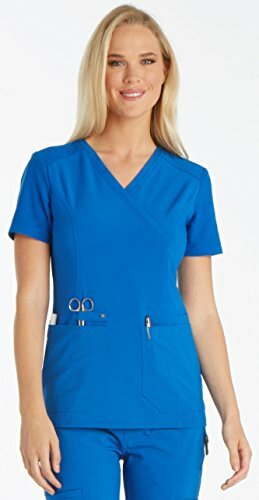 Unique pockets and knit panels make this iflexTM Women's Mock Wrap Knit Back Panels Solid Scrub Top a modern must-have scrub style. Find a space to store every item on a silhouette that flatters from every angle. 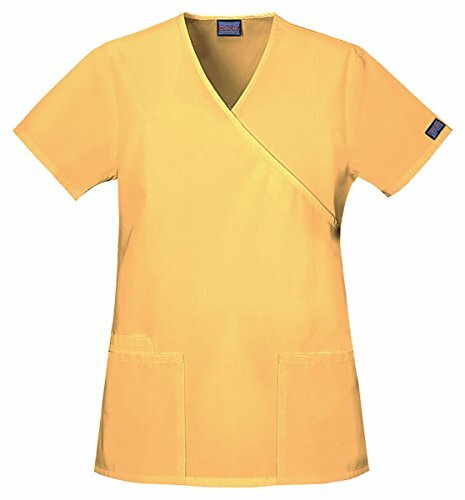 Junior contemporary fit Crossover mock wrap v-neckline Short sleeves Slanted front shoulder seaming with badge loop Side knit panels with pocket at right side Back princess seam knit panels Two front patch pockets with mini front pockets and instrument loops and pen slots Wash and wear wicking fabric 96% polyester 4% spandex crosshatch dobby with 88% polyester 12% spandex knit Center back length: 26" This product can be shipped anywhere in the 50 United States Puerto Rico The US Virgin Islands and APO and FPO addresses. Sorry we cannot ship this product to any other address.